Today (April 16) is her memorial. 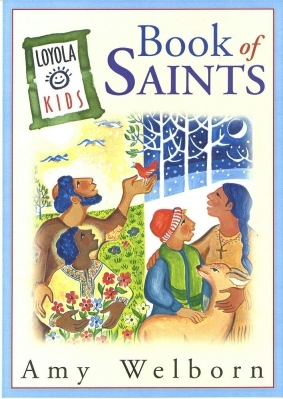 Loyola has the entry I wrote on St. Bernadette for The Loyola Kids Book of Saints up on their website - you can read the whole thing here. Bernadette's life wasn't easy to begin with. 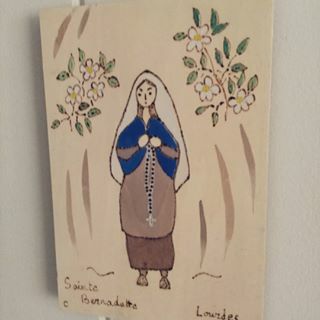 She and her family lived in terrible poverty in a village in France called Lourdes. By the time she was 14, Bernadette had been sick so often that she hadn't grown properly. She was the size of a much younger girl. She, her parents, and her younger brothers and sisters all lived in a tiny room at the back of someone else's house, a building that had actually been a prison many years before. They slept on three beds: one for the parents, one for the boys, and one for the girls. Every night they battled mice and rats. Every morning, they woke up, put their feet on cold stone floors, and dressed in clothes that had been mended more times than anyone could count. Each day they hoped the work they could find would bring them enough bread to live on that day. Like other girls, Bernadette had many friends. She spent time with them in the countryside, playing and gathering wood for their families' fireplaces and stoves. One cold February day, Bernadette was out with her sister and a friend, doing just that. They wandered along the river until they came to a spot where a large, shallow cave called a grotto had formed in the hilly bank. Bernadette's sister and friend decided to take off their shoes and cross the stream. Because she was so sickly, Bernadette knew her mother would be angry if she plunged her thin legs into the icy water, so she stayed behind. But after a few minutes, she grew tired of waiting for her companions to return. She took off her stockings and crossed the stream herself. What happened then was very strange. The bushes that grew out of the grotto walls started blowing around as if they were being blown by a strong wind. Bernadette looked up. High above her in the grotto stood a girl.